My normally wordy self has been absent for a few days due to traveling. I'll tell you more when I get all the pictures uploaded to my gallery, but it involved my mom, her friend, some yarn, lots of beer and wine, horses, and a city that is very happy about their Boys of Summer right now. My poor husband was such a good sport, considering he was surrounded by knitters. And yes, I'm frogging that scarf. Just not yet. I'm almost done with Joe's sock, and I have an adventure today that will push all negative scarf thoughts out of my head. Forever. Are you back yet?! Are you back yet?! Did you see the Yarn Harlot?! Did you get her picture?! What did you buy?! What did you see?! Eeep! 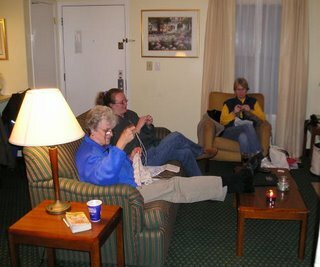 girlfriends, wine, yarn. What's not to like? Haaaaay to my Secret Pal!